Pee Pee Viewpoint is a must to add to your Phi Phi Travel Plans. The sign at the top of the viewpoint says Pee Pee Viewpoint, but many visitors refer to it as Phi Phi Viewpoint. From the top of the viewpoint you will see the best views over this island paradise. The views over Dalum and Tonsai bays and out towards Phi Phi Ley are well worth the walk up the stairs and winding path that climbs to the lookout at about 180 meters above sea level. 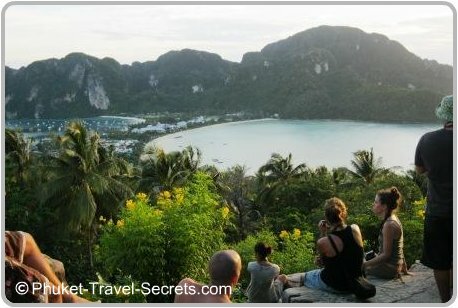 You will find that many visitors plan their walk up to the viewpoint in the afternoon when it is a bit cooler, and to enjoy the amazing sunset view looking out towards Phuket. If you are planning on heading up to the Phi Phi Viewpoint for the sunset, plan ahead and leave yourself plenty of time to get to the top. We came across several families and backpackers on our way back down that would not have made the lookout before dark. Wear comfortable clothing and walking shoes or sandals and take some refreshments like a bottle or two of water to make the walk to Phi Phi Viewpoint a bit easier. Getting to the viewpoint is easy, just follow the signs as you go through Ton Sai Village heading northwest, don’t get fooled into taking the path to Phi Phi Viewpoint Resort which is easy to do. Below is a map to help you with directions. The walk to the viewpoint will take around 30 to 45 minutes to reach the top, depending on your fitness level. The initial climb up the stairs from Ton Sai Village is a killer, even for the young as you will see in the video, struggling after thinking they could jog to the top. When you get to the top of the stairs you will have a choice of either heading to the left and following the path that goes to the main viewpoint. Or taking the right hand path which will take you to Viewpoint No 1. Viewpoint No 1 is a great spot to take in the beautiful views while you take a few minutes to catch your breathe and to have a drink at the rest point. You will find the walk a bit easier with a winding path on a gradual incline heading to the main lookout or Viewpoint 2 as it is known. As you follow the path you find some great photo opportunities of Phi Phi’s local wildlife residents, and some fantastic views looking down through the trees onto Tonsai Village. The path plateau’s out and is an easy gradual walk until you reach the last section, which is rather step. 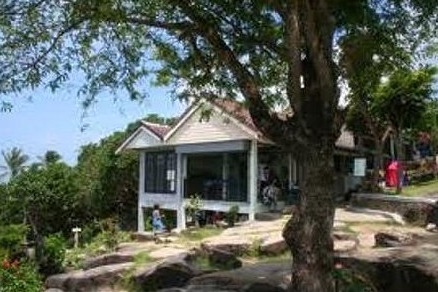 When you get to the top, you will find the Pee Pee Viewpoint café, has a good supply of water, soft drinks and snacks. If you plan to enjoy a romantic sunset from the top of Pee Pee viewpoint, just be aware that this is a popular attraction on Phi Phi. The viewpoint can get very crowded, especially in the high season when it would be best to get to the viewpoint early to get a good vantage point.